Preheat oven to 180°C. Line a 20cm square cake tin with non-stick baking paper. Cut the broccolini stems and florets in half lengthways. Cook the broccolini in a large saucepan of boiling water for about 1 minute or until just tender. Drain well and set aside. Whisk the eggs in a large jug and season with pepper. Arrange half of the broccolini in straight lines across the base of the cake tin. Sprinkle over half the goat's cheese. Pour in the egg mixture. Arrange the remaining broccolini and goat's cheese on top. Gently submerge the broccolini and cheese into the egg mixture. Bake for 40 minutes or until set. 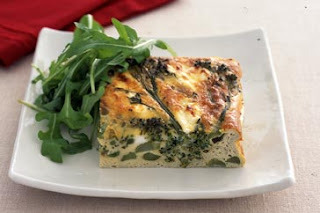 Cut into squares and serve with the rocket salad.